Below is the RSPB’s opposition to West Cumbria Mining’s proposal for a new coal mine off St Bees. Despite “further information” asked for from the developers the RSPB’s objections still stand (how could they not!) It is so very bizarre that the many objections to the mine are not front page news in the national press. There is only three months to stop the mine, if you can make a pledge towards our legal case please do…no matter how small. 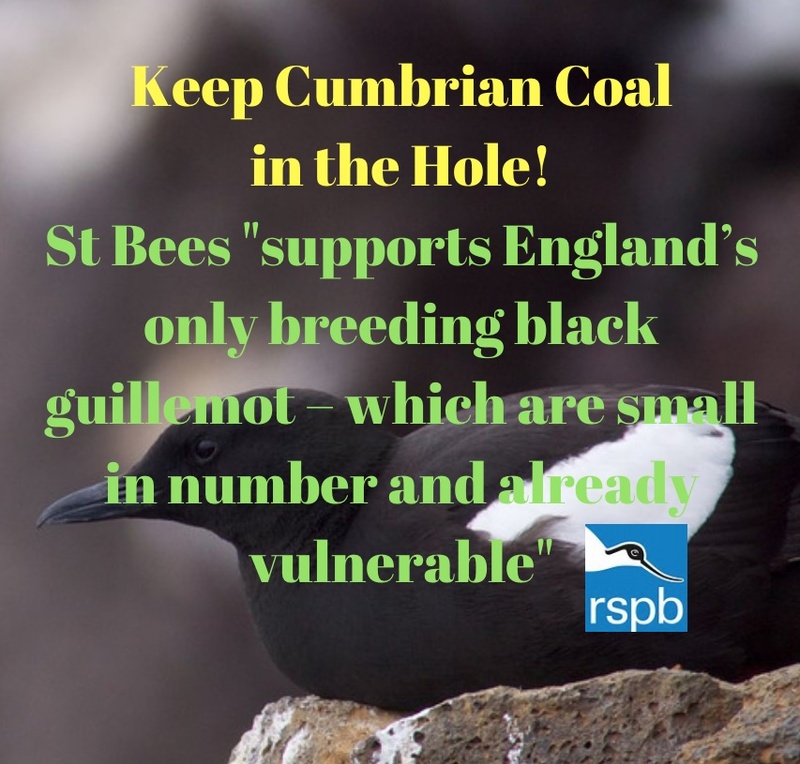 Please join with the RSPB and Keep Cumbrian Coal in the Hole and others in objecting , please do – the more objections the more chance that the Council will say a big fat NO! Thank you for further consulting the RSPB on the above proposed development. The RSPB submitted a previous response (27th August 2017) in which we noted that some gaps in the evidence provided in support of the planning applicationhadbeenidentified. SomeoftheseomissionsmayberesolvedaspartoftheseparateMarine Management Organisation (MMO) licensing process – when a full EIA will be submitted. However, because the MMO licensing and planning application processes are not simultaneous, this causes difficulties for the Council when considering the planning application. Therefore, the RSPB agrees with Natural England’s advice that a suitable level of precaution must be adopted when considering the potential impacts of the development upon the marine environment. The proposal has the potential to have an adverse effect upon the designated sites listed below – both during construction and operation. Paragraph 17.28.1 states that “a temporary discharge of water from the dewatering of the anhydrite mine works is currently under discussion with regulators, including the Environment Agency, Natural England and the Marine Management Organisation. Since this will be subject to a separate application and environmental assessment for Permit to Discharge, this aspect is not considered further here”. In particular, we would like to see further information on the composition of the mine wastewater along with a modelling of dilution. In our previous response, whilst accepting that the majority of excavation will not take place beneath the MCZ or SSSI, the RSPB advised that further assessment was necessary as to the potential for impacts from subsidence arising from excavation of the two proposed access zones. We also considered that an assessment should be undertaken of the potential for vibrations/subsidence arising from construction and operation of this development to impact any weaker areas of the cliff face (through rock fall) which supports the main nesting seabird colony. Page 75 of the Addendum: Seismicity – provides further detail as to the risk of induced seismicity as a result of mining activities. The applicant concludes that “minor seismic events will be significant below a magnitude 3 event, and any event which may occur as a result of mining activities will not cause damage to people, property or the naturalenvironment”. WeconsideritimperativethattheCouncildeployasuitablelevelofexpertisetoensurethat the additional information provided by the applicant provides a robust assessment of the potential for seismic events – both in magnitude and frequency – to have an adverse effect upon designated sites listed above. In particular, upon the notified features of the SSSI – which include geological features and isolated breeding bird colonies. It should be noted that the SSSI supports England’s only breeding black guillemot – which are small in number and already vulnerable to stochastic events. Paragraph 11.11.8 states “the overland pipe, if installed, will extend from the western edge of the Application Site, and then travel across land for approximately 1km. The pipe will pass through the northern edge of the St Bees Head SSSI, before linking with the existing outfall (outside of the SSSI). Although the pipe will pass through land within the SSSI, no significant adverse effect upon the site’s interest features are considered likely. The pipe will be regularly maintained and monitored meaning the risk of any significant leakage is considered to be low. The pipe will be removed once the dewatering operation is complete (expected within 10-12 months of start of dewatering)”. In our previous response we advised that further information/evidence was required as to how the developer has undertaken the above assessment and arrived at the conclusion of no adverse effect. We note that a botanical survey has been undertaken of the proposed pipeline corridor but it is also important that the applicant assesses the potential for the pipeline to have an impact upon nesting birds during its construction, decommissioning and operation. The development has the potential to have an adverse effect upon the St Bees Head SSSI through disturbance to breeding birds during excavations and coal processing. Paragraph 11.11.9 concludes that “during the operational phase of the development and in accordance within the designed mitigation measures described previously, any operational noise, vibration and dust emanating from the site and processing operations will be significant at site level only. No significant impacts arising from the working operation are anticipated to affect the St Bees Head SSSI, located 500 metres to the west”. Paragraph 11.11.4 concludes that “no significant adverse effects arising from construction phase activity (such as vehicle movements, site clearance, and increased percussive noise) within the main development site upon statutorily protected sites within wider area, including the St Bees Head SSSI are considered to be likely”. In our previous response, we considered that there was insufficient evidence to be able to evaluate the potential for impacts upon the SSSI, nor the efficacy of the proposed mitigation. In particular, the noise assessment detailed in Chapter 14 does not make the link between the development and any ecological receptors. We note that no further evidence has been presented by the applicant in this regard. In summary, the RSPB’s opinion is unchanged – in that insufficient information has been submitted by the applicant to allow a robust assessment of the potential ecological impacts of this proposal.